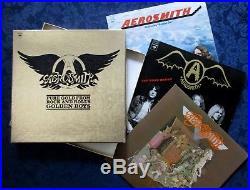 AEROSMITH/ Pure Gold From Rock And Roll's Golden Boys / Vinyl, 3-LP Boxed Set Promo. 1976 Columbia A3S-187 Includes Promo Stamped Lps, of Aerosmith, Get Your Wings and Toys In The Attic encased in a gold foil box. 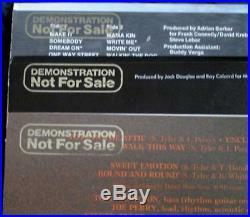 Each album cover is stamped on the back "Demonstration Not For Sale". Given to radio station VIP's in 1976 as a way of saying thank-you. These came with an accompanying letter. Discogs Note: Because the albums were not a tight fit within the box and they were stored in an upright position. Some album covers may exhibit slight warping. 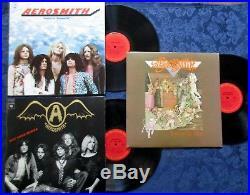 ALBUM COVERS: Aerosmith - EX-, top seam split. Get Your Wings - EX-, top seam split. Toys In The Attic - EX-, top seam split. All albums come with inner sleeves. Each LP is stamped on the back "Demonstration Not For Sale" in gold. BOXED CASE: EX-, one or more of the corners has been repaired. A true collectible for the Aerosmith fan or Promo collector. STILL SEALED (SS) - Still in original shrink, never opened. Any shelf-wear, drill hole, saw mark or cut corners will be noted. Please Note that a sealed album doesn't mean a mint album. Some imperfections are only discovered after an album is opened. NEAR MINT (NM) - The album has been on a shelf between other records. The vinyl looks glossy and clearly has only been played a few times. There are no marks on the vinyl and the whole package is complete. EXCELLENT (EX) - Not as good as NM but better than VG+. VERY GOOD + (VG+) - Used but very well taken care of. Covers will show signs of use. May exhibit slight ring wear, corner dings, creases, slight color fading. Vinyl may have light marks, scuffs or scratches. May exhibit slight warps that do not affect play. May exhibit slight surface noise, crackle or pop that won't over power the overall listening experience. Will satisfy all but the most demanding collector. VERY GOOD (VG) - A used well-loved, reasonable copy. There will be obvious signs of wear to the cover. The vinyl too will have marks and usually light surface noise between tracks and during quiet passages. All items are packaged securely and responsibly using album mailers and are reinforced and/or double boxed. All albums and records are placed in mylar storage bags before packaging. Sorry, but we do not sell outside of the USA. The item "AEROSMITH PURE GOLD FROM ROCK AND ROLL'S GOLDEN BOYS 3 ALBUM BOX SET PROMO LP's" is in sale since Friday, October 5, 2018. This item is in the category "Music\Records". The seller is "londonbooks2000" and is located in Ashland, Kentucky. This item can be shipped to United States.